In spite of being on sale for a good seven years, the third generation C-Class wasn’t exactly as dated as you would expect. However, the new model just takes things forward and that too in a big way. The styling takes hefty cues from Mercedes’ flagship sedan, the S-Class. There is a striking similarity between the S and the C, while the upcoming next generation E-Class will also be largely like the best car in the world, thereby falling in sync with the Stuttgart automaker’s new design language. Still if one looks closely, they can easily distinguish the new C-Class from the S-Class, the smaller Merc having more compact proportions although it has grown up in size when compared to its predecessor. The fourth generation Mercedes C-Class looks every bit as elegant as a car with the three pointed star should. There is the twin-slate grille at the front with the logo sitting right between while the full LED lights at the front and rear have massive detailing. The vehicle has prominent lines running across, giving it a clean and purposeful stance while the necklace shaped tail lights gel well with the V-shaped boot. The detailing on the lower parts of the bumper give the car a sporty flavour, the rear getting a diffuser and nicely shaped exhaust pipes. Overall this car does make most people mistake it for an S-Class and that’s a huge compliment in itself. While the layout of the new C-Class’ interior is similar to that of the previous car, we can see signs of the company’s new design philosophy. Standard creature comforts include a tablet-like screen, climate control, panoramic sunroof and the latest version of the COMAND infotainment system. This infotainment system integrates a Garmin navigation system with 3D-visualisation and gets a new interface design with a touchpad as standard. The C-Class comes with a 2.0-litre turbocharged petrol engine that produces 181bhp and 300Nm of torque. This comes mated to a 7G-TRONIC, and there is only petrol is available at the moment. The new C-Class has been built on a new lighter platform and this has improved the driving dynamics. The engine feels a lot peppier and surely a lot more fun to drive. There is sufficient power at any speed and the C-Class is a lot more nimble than before. Push the accelerator pedal and the C is always ready to lift its skirt and begin running. The diesel engine is 2.2-litre four-cylinder engine that produces 168bhp of power and 400Nm of peak torque. This engine also gets the same seven-speed transmission. The power is linear and this time the C220 even gets paddle shifts. The C-Class certainly a lot more agile to drive and it does feel like an E-Class when you get behind the wheel. There are various driving modes too, Economy, Sport and even Sport+. The ride quality has been improved too, despite the C-Class having the best ride in its segment already. The modes are only for the throttle response and gearshifts; there is no suspension set-up option. No car brand offers this feature in this segment. 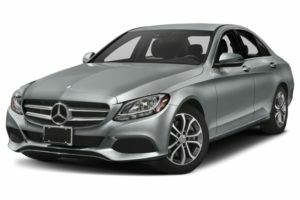 This entry level luxury sedan aims at offering superior passenger comfort, more than the driver’s, and does this fairly well. The suspension cannot be altered through the Drive Select modes, but can tackle even poor city road surfaces with aplomb. It’s just during enthusiastic driving that misses firming up the suspension a bit. Sharp turns do let in fair bit of bodyroll and thankfully there’s enough electronics to keep the drive in control. The low profile 225/50 R17 lets in severe harsh bumps through the cabin, but for most parts the car maintains its poise. Interestingly, the ground clearance has improved and the new Mercedes-Benz C200 can be now driven around town without having to worry about it scraping its underbelly. Also impressive is the turning radius of 11.22m which makes maneuvering the car a breeze. Another important change is the all-new completely electric steering wheel which although lacks the feedback of the older hydraulic steering system, but does not feel artificially weight and is quite accurate. The new C-Class is not the most fun car to drive in its segment, but isn’t too far behind either. The C-Class lives up to Mercedes’ reputation for classic luxury – few, if any, cars can match the level of upmarket style you’ll find in the C-Class. You’ll also enjoy a comfortable ride, even over rough bits of road. The C-Class is not, however, thrilling to drive. But that’s okay because there are other luxury small cars to choose from if that’s what you want. The Mercedes C-Class is unapologetic in the way it treats you to refined comfort.